Are you travelling to New Brunswick, Nova Scotia or Prince Edward Island? We invite you to visit Maritime Bus’s website and view the map of their large network. 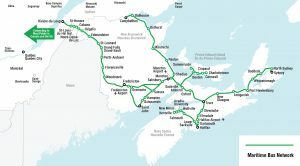 Please note that it is possible to take an Orléans Express coach to Rivière-du-Loup and, from there, transfer on the Maritime Bus network to continue your journey towards the Maritime Provinces. The service is offered 4 days a week, on Tuesdays, Wednesdays, Fridays and Sundays. Regarding connections to Québec and Montréal, the timetable is designed to coordinate with Orléans Express’ schedule. After taking passengers in La Tuque, the coach will make a stop in Grand-Mère, Shawinigan and Trois-Rivières. To see the complete schedule of the the Haut Saint-Maurice Collective Transport as well as the fares (in french only) or call the toll free number 1 855 523-2971. Click here to see the complete schedule of Bus A1 or call 1 418 332-3555. Click here for details (in french only) or for the refund form (in french only). by fax at 418 335-5122. * All refund requests must be supported by receipts, incomplete requests may be denied. Take advantage of exclusive discounts for our newsletter subscribers ! Merci, vous êtes maintenant abonné à notre infolettre. Your account is a must-have (and free) tool to manage everything! Enjoy a direct access to your tickets, order history and Express Meter points! Travel, Share, Survey. Free travel has never been so easy! Travel between Montréal and Québec starting at $25. Book at least 8 days in advance to enjoy these fares. The time period to complete your transaction has elapsed. Please start over. By starting a new search, you will lose the tickets previously selected.